THE HITTING: There's not too much that can be complained about with this team's hitting in 2018. On the whole, the offensive firepower was excellent and at times downright scary. There were times where their bats seemed to go quiet for stretches of games (I'm thinking of mid-August to mid-September in particular), but overall there's not much negative with the hitting. If I do have one complaint, it's that the lineup got very little production from the catcher and second base positions. The catcher spot was particularly abysmal, with the team's two main catchers (Sandy Leon and Christian Vazquez) not even hitting their weight (.177 and .207, respectively). Blake Swihart emerged as the second catcher for a span of a couple of months when Vazquez was out with a broken finger and provided solid defense, speed on the bases, and some production at the plate despite his limited playing time (.229, 3 home runs, 18 RBI, and 6 stolen bases). The heavy lifting was done by the top of the order where Mookie Betts, JD Martinez, and Xander Bogaerts all had career years. As a team, the Red Sox hit .268 (1st in the league), hit 208 home runs (6th), and scored 876 runs (1st). Their team slugging percentage (.453), on base percentage (.339), and total bases (2250) were all tops in the league. And after hitting zero grand slams in 2017, the 2018 Red Sox hit TEN of them in 2018. All in all, a fantastic offensive season. THE FIELDING: The team defense was solid in 2018, but it's important to look at the outfield separately from the infield. The outfield trio of Andrew Benintendi, Jackie Bradley, and Mookie Betts is one of, if not the best defensive outfield in the league. Their ability to get to balls most outfielders can't get to and their ability to get the ball in quickly limited the amount of runs their opponents scored. Oftentimes it was just the threat of how good they are that intimidated opposing players to be more conservative on the bases. I've got nothing but effusive praise for the outfield defense in 2018 and while there was a dip in their prowess on the nights when JD Martinez substituted for one of them, overall it was still top notch. As for the infield, that's a bit more complicated. Starting with the catcher spot (because I'm a former catcher), Sandy Leon was the standout. His defense was excellent and every Red Sox pitcher voiced their preference in throwing to him over the others. Christian Vazquez seemed to regress a bit and I've always thought his defense was a bit overrated, while Blake Swihart didn't play enough to really stand out although what I did see was decent. Around the infield, the best two positions were first base (manned predominantly by Gold Glover Mitch Moreland this season) and shortstop (where Xander Bogaerts blossomed into one of the better defensive shortstops in the league). The two areas of major concern were second base and (especially) third base. At second, it was mainly an issue of lack of continuity since for most of the season it was manned by the platoon of Eduardo Nunez and Brock Holt. Ian Kinsler brought some defensive stability to the position once he joined the team. The issues at third base, however, were mainly to do with Rafael Devers being a rookie and going through some growing pains. He committed 24 errors, tops among third basemen, and needs to work on his footwork and throws if he wants to improve. 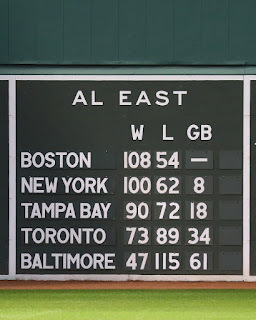 As a team, the Sox committed 77 errors (good for 3rd in the AL) and had a fielding percentage of .987 (2nd), so on the whole it was a solid season. THE BULLPEN: ...which is a nice segue into discussing the team's biggest weakness: the relief corps. All season I debated (some would say argued) with stathead Red Sox fans who told me that "the numbers say the Sox bullpen is a top five bullpen." Yes, the numbers say that...but what do your eyes tell you? This bullpen was inconsistent all season and at times, they were downright awful. Craig Kimbrel was the only one that was trustworthy all season and even he had a very shaky second half of the season. Even finishing as strong as he did, his walks were way up and there's some concern that he's not as dominant as he's been in the past. Still, he finished with 42 saves, 96 strikeouts, and an ERA of 2.74 so he's still a bright spot. It's been the middle relief that's been this team's Achilles heel for the last few seasons and that didn't change in 2018. Ryan Brasier was a surprise and for the most part did an admirable job in his appearances, but it was the usual suspects who have been with the team for a while that made this subsection of the team so awful. Joe Kelly is, as I've been saying for a few years, a thrower and not a pitcher. He throws hard and yet throws one of the most hittable 100 mph balls I've ever seen. Just when he'd go a short stretch where it looked like he finally put it all together, he'd fall apart for a month. It's been four seasons with the Red Sox and he still hasn't gotten it...at this point, it's safe to say he never will. It's time to cut bait with him, as it is with Heath Hembree. If you've been reading me all season, you'll know how I feel about Hembree. Simply put, he's awful. He almost always blows it in high pressure situations and has been a detriment to the team for years. Matt Barnes was a guy who looked like he'd finally matured into the "bridge guy" to get from the starters to Kimbrel, but his inconsistency and poor control reared their heads again and again. I understand he was hurt to finish the season, but he still doesn't inspire confidence. Perhaps the worst culprit of all was Tyler Thornburg. After finally throwing a pitch for the Red Sox this season, he might have torpedoed the Sox chances at having a good bullpen with a solid July. After a shaky start to the season it looked like he'd finally figured it out in July, enough so that he lulled Dave Dombrowski into thinking that the middle relief issues were solved. This caused the Sox to stand pat at the trade deadline and not acquire another reliever; it came back to bite them in a big way when Thornburg reverted back into being lousy in August before being shut down for the season in mid-September with an injury. As I've said all season, the Sox got swindled in the trade that sent Travis Shaw to Milwaukee for Thornburg and, as I've also said all season, if the Red Sox don't make a deep postseason run in 2018 it will be because of the bullpen. THE MANAGER: Not much more can be said about Alex Cora that I or others haven't already said. He was, quite simply, the best acquisition the Red Sox made in the offseason. He's pushed all the right buttons, the players love him, the fans do, he's accountable, inspiring, a great leader, and knows the modern game inside and out. If I have one gripe with him (actually two) this season, it's his tendency to rest guys a bit too much which ties into the second gripe: I think he took his foot off the gas a little too early. In the second-to-last series against the Yankees the Sox needed to win one more game to clinch the division and yet Cora started putting lineups of recent call-ups and bench players out there. The Sox went 5-7 from that series to the end of the season and while I know the games were "meaningless" in terms of the standings, I maintain that Cora eased up a week too early. If it were up to me, I would've played that series in New York and the following series in Cleveland to win before coasting to the end against Baltimore and the Yankees in the season's final week. Still, you can't quibble too much with 108 wins and home field advantage throughout the postseason. In total, Cora was a resounding success. Mookie Betts - What more can be said? Barring some incredibly unlikely unforeseen circumstance, Mookie should win his first AL MVP award this season. All he did was win the AL batting title with a .346 average while clubbing 32 home runs and 80 RBI. He also stole 30 bases (and becoming the second Red Sox player ever to have a 30/30 season) to go along with 180 hits and 129 runs, all while finishing with a ridiculous OPS of 1.078. And he did all of that while hitting out of the leadoff spot (imagine the RBI total if he was in the 3-4-5 spots!). Combined with his Gold Glove defense in right field, it's easy to see why Mookie should win the MVP as one of the most electrifying and complete players in the game. JD Martinez - On any other team without Mookie (or Mike Trout), JD's season would have garnered him the MVP award. He provided the power threat in the heart of the order that the Red Sox sorely missed last season in the wake of David Ortiz' retirement. He flirted with the Triple Crown all season and finished with the gaudy totals of a .330 average (2nd in the league behind Mookie), 43 home runs (2nd behind Khris Davis), and 130 RBI (tops in the league). But beyond the numbers, JD was a great clubhouse presence and hitting guru for the rest of the team. Quite simply, as a player and a person he was one of the best acquisitions the team has made in a long time. Xander Bogaerts - The knock on Xander for the last few seasons has been that he hasn't been able to put a complete season together. In particular, over the last two years he's started out strong only to fade badly in August and September. Part of it has been bad luck (his hand injury in July of last season) but it's also looked like fatigue has played a factor. In 2018, he finally put it all together over the entirety of the year to have a career season. In addition to his improved defense as a premium position, Xander produced at the plate from the beginning of the season to the end, hitting .288 with 23 home runs and 103 RBI. Entering his prime years, Xander is now one of the premier shortstops in the league. The Bullpen (Except for Craig Kimbrel) - I don't need to add much to what I already wrote above. They were, quite simply, awful. The numbers make them look better than they really are because the Red Sox scored so many runs that they pitched in a lot of blowout wins. This part of the team needs a complete gutting and rebuild for next season. Whether that happens or not is anybody's guess. Drew Pomeranz - Just a terrible, terrible season and in his walk year, too. He started the season injured (again) and when he came back he was as ineffective as ever. He never became an efficient starting pitcher and this season, he ceased to be an effective one. Eventually he was moved to the bullpen where he became Cora's "white flag" guy in blowout losses. More than ever it looks like his 17 win season a year ago was a fluke. Luckily he's almost certainly thrown his final pitch as a Red Sox. Best of luck on him on fooling someone into giving him a lot of money on the free agent market this offseason. Christian Vazquez - I thought it was a bit dumb of the Sox to extend Vazquez this past offseason and it looks like I was right. His defense, which I always thought was overrated, regressed and by the end of the season none of the pitchers wanted to throw to him over Leon. His poor batting, which was the knock on him in the minors, continued to be atrocious. Not that Leon was any better, but at least the pitchers all liked throwing to Sandy. With his molasses-like speed on the bases, Vazquez doesn't bring much to the table that Swihart doesn't and if it were up to me, I'd move him down to the third catcher behind Sandy and Blake. That'll never happen with the money they gave him last year, but it can't be just me who noticed that the team played their best baseball of the season from the time Vazquez went out with his finger injury to the time he came back. Jackie Bradley - First, let's get it out of the way: Jackie's defense in center field was again superb and he continued to make plays that blew everyone's minds. How many times did he make a play where everyone said "how did he do that?!" He makes difficult plays look routine and impossible plays look merely difficult. He should finally win his first Gold Glove this season...we'll see. As for his hitting, it was so bad at one point that Cora sat him for a week to clear his head. Since the All Star break, though, Jackie was one of the better hitters on the team and provided some much needed power at the bottom of the order. He finished hitting .234 with 13 home runs and 59 RBI to go along with 76 runs scored and 17 stolen bases. Those numbers may not look like anything special at first glance, but if you think about how well he had to hit over the second half of the season to bring his abysmal first half numbers up to those totals, it should impress you. Andrew Benintendi - After a rookie season in 2017 that would've netted him Rookie of the Year if not for the presence of Aaron Judge, Benintendi struggled a bit in 2018. It wasn't quite a sophomore slump as he still finished with good numbers (.290, 16 home runs, 87 RBI, 103 runs, 21 stolen bases). However, only three of those homers came after July 1st and he went through a stretch in August where he was really scuffling. His defense is excellent and while he still runs into too many outs on the bases, he has improved his baserunning. He's still an electric player (and still only 24!) and looks to have many excellent seasons to come. Rafael Devers - Devers had a challenging rookie season. As mentioned above, his defense left a lot to be desired. He battled shoulder and hamstring injuries in the second half of the season and went through some brutal stretches at the plate where he really slumped. He finished the season strong with a solid September and his final numbers of .240, 21 home runs, and 66 RBI don't look too bad. Yes, he swings at too many bad pitches (especially breaking balls in the dirt) and he struggles against lefties, but his power is legitimate and he's incredibly raw and young (21). I've no doubt he'll look a lot better in a couple of seasons as he matures and learns from his teammates. Whether it will be at third base or whether he changes positions, I don't know. The challenge now is for him to avoid a sophomore slump next season. THE FINAL ASSESSMENT: There's no other way to put it: the Red Sox 2018 regular season was a resounding success. While it wasn't perfect and there were some areas of concern, you can't argue with the results: 108 wins, the best record in all of baseball, and the presumptive AL MVP in Mookie Betts. The fact that JD Martinez would win the MVP in most any other season should tell us all how blessed the team is to have both him and Mookie on the same squad. Alex Cora was the perfect manager for this group of players and the team chemistry seems to be incredible, certainly better than it was under John Farrell the last two seasons. The 2018 team brought the fun back to Fenway Park and was embraced by fans in a way they haven't been since the 2013 World Series champions. Their next task will be to parlay this season into a deep playoff run. They don't necessarily need to win the World Series (although that would of course be great), but after the way the last two postseasons ended they need to at least make it to the ALCS and put up a good fight. 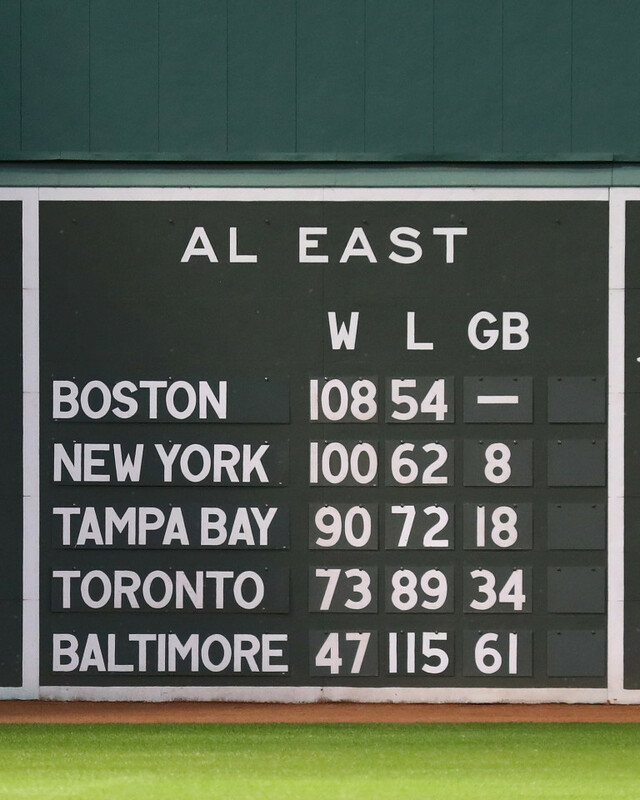 It all begins Friday night against the Yankees in the ALDS, but let's make sure we in Red Sox Nation don't forget or discount the monumental achievement that was their regular season. It was a season for the ages and one the likes of which we probably won't see again for a long time, if ever.